We’re just under 2 months away until the release of The Hunger Games, and can I just say – thank god! After drooling through and totally loving Breaking Dawn Part One, I’ve been desperately awaiting the Hunger Games movie (not that the two are comparable, but you know what I mean), which opens worldwide March 23rd, 2012. Thankfully, yet another still has been released – and it’s of none other than our amazing two lead characters, Katniss Everdeen and Peeta Melleck (Jennifer Lawrence and Josh Hutcherson respectively) decked out in their District 12 training outfits. The Gary Ross directed film is based on Suzanne Collins’ book, in which exists a future run by the evil Capitol of the nation of Panem who yearly select one boy and one girl in one of the twelve districts to fight to the death on live television. A twisted punishment for a past uprising and an ongoing government intimidation tactic. 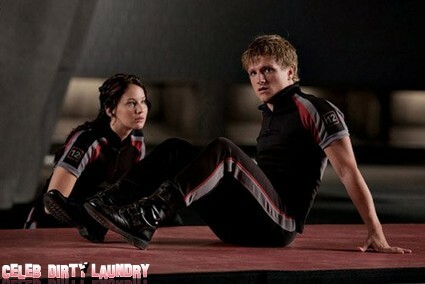 The image released is of Katniss and Peeta who were pick to fight for their district wearing their District 12 uniforms. The two look exactly as I imagined they would. Just another image to get my excitement level piqued!